What are you currently doing to monitor student performance in your school? It seems as though I have been asked this question a thousand times over the last few months. There is a tremendous push to deeply mine for the data that will help improve instruction and student outcomes. The range and volume of data available to schools today makes it particularly difficult for teachers to parse the numbers. Students are being given simple predictive curriculum based measurements, a variety of formative and benchmarks assessments as well as the traditional summative criterion and norm referenced tests. Question: Do we need all this assessment? Answer: Probably not, but can students in your school successfully build a garden shed? If your goal is to have your students build a simple structure, like a garden shed, you would probably want to make sure they were proficient in hammering nails. Hammering nails is perhaps the most basic and essential skill needed to accomplish this goal. Monitoring student proficiency is simple. You can count the number of nails a student hammers into a block of wood in a given amount of time…say one minute. You can subtract the number of bent nails from the total and establish a benchmark for proficiency. A student who hammers 20 or more nails in one minute might be considered proficient while a student who only hammers 15-19 nails would be near proficient and anyone who hammers less than 15 would be at risk. The research has shown that students who are proficient at hammering nails are more likely to successfully build a garden shed. Hammering nails is therefore a solid predictor of student shed building success. The value of the one-minute nail pounding assessment is important but limited, as it merely predicts the speed a student can hammer nails. Building a garden shed requires much more than just hammering nails. If the students are going to successfully build a garden shed, they will eventually need to understand how to read a blueprint, use a tape measure, level the foundation as well as frame, plumb and square the walls. Students will also need to be able to install the trusses, roof and shingles. Doors and windows need to be hung, siding and finish trim installed with a fresh coat of paint applied to the finished building. If a teacher wants to ensure that every student will succeed, they will need to monitor student performance every step of the way. A student may make an initial attempt to level the foundation and fail to accomplish the task. If this goes unnoticed, the final outcome is already compromised. If the teacher recognizes the error and remediates the student until they have successfully completed the task, the potential for complete success remains. Teachers increase the likelihood of success for each student so long as they continue to monitor student performance and ensure that the students master the skills and tasks required for each objective. Along the way, the teacher may find that some students already possess the required skills or become proficient more quickly than others. These students could be encouraged to modify the complexity of their garden shed by adding dormers, details or structural modifications. Those students who struggle to master the necessary skills may, in turn, modify or simplify their structures to accommodate for their needs. 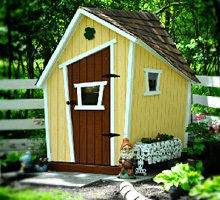 Students using the essential building skills they have acquired will present unique garden sheds that meet the established criteria. Upon completion of each student’s garden shed, the teacher needs to assess the totality of the students work. Did the student successfully build a garden shed? Was the quality of the student work proficient and how does their garden shed compare to the work of the other students? The evaluation of the completed project provides a summary of the student’s success or failure and allows the teacher to evaluate his/her own success as an instructor/teacher. This information may prove valuable for the teacher as they look to improve upon their future practice, but for the student, there is little opportunity to address skill deficiencies given that the time to complete the shed has passed. Hammering nails is an essential skill and may loosely correlate to the successful building of a garden shed, but it is the development and application of a myriad of skills that ultimately determine whether or not a student will be successful. If a teacher wants to maximize the number of students who succeed, they must ensure mastery of the essential skills. When every child can successfully hammer a nail, lay a firm foundation and build upon it a solid structure, you increase the likelyhood that none of them will ever be left out in the cold. As a start-up company, there are many milestones to be reached. This past week, we reached a very important one here at MasteryConnect! Three of the leading institutions that fund education technology led a round of investment in our company. The NewSchools Venture Fund is a non-profit venture philanthropy firm based in San Francisco that “raises philanthropic capital from both individual and institutional investors, and then use those funds to support education entrepreneurs who are transforming public education.” We’re very excited to join the NewSchools family of investments. We’re also very excited about the investors that participated in this round including Learn Capital, ImagineK12, and an amazing group of angels who believed in us from the beginning. Check out the press release if you’re interested. We were also featured in a FastCompany blog article this past week talking about the investment. So what does this mean to you as a teacher and educator? It means MasteryConnect can continue to provide the FREE learning community for teachers to share common assessments across the Common Core states! It allows us to build the ‘next generation’ of assessments through great people like you…the teachers, curriculum people, and administrators sharing these great new assessments around the Common Core. It allows us to grow as an organization to better serve your needs and respond quickly to build the features that you are requesting! We’re excited about this next phase of growth and look forward to your input as we strive to serve you! We recently sat down with the 7th grade Math team at Ecker Hill Middle School in Park City, Utah to talk about their experience in rolling out the Common Core. In the interview we discuss their process, the challenges they’ve faced, the math practice standards, and their use of MasteryConnect to facilitate the roll-out. Many thanks to these amazing teachers for sitting down with us! We were inspired by their passion and dedication to helping all their students achieve mastery.